Nervous members of the public stood, frantically reciting lines and awaiting their turn to participate in ‘Time Has Fallen Asleep In The Afternoon Sunshine’ by Mette Evardsen. Calmly perched amongst this fluster in Birmingham’s renowned Central Library, dressed in a recognisable yellow Fierce T-Shirt, was a friendly face that goes by the name of Megan. When she isn’t studying at DeMonfort University in Leicester, Megan is a volunteer at Fierce Festival 2012. Here on a placement for her course, Fierce Festival is enabling her to gain valuable experience by, to name a few: organising dog owners at Dashund U.N., sourcing props for Gifts of the Spirit and contributing glitter and feathers to the ever so eccentric Shabba Dabba Dah. 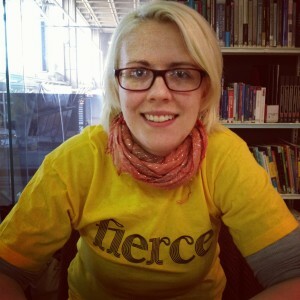 We interviewed Megan to get an insight into the experience of being a volunteer at Fierce 2012. Q. Has Fierce Festival 2012 been everything you expected it to be? Megan: It has, in fact it’s been more! Though massively stressful at times, I can say easily the best thing I have taken part in. I have never had so much fun on a University placement! Q. Based on your experiences so far do you feel there is anything missing from Fierce Festival 2012? Megan: More time to enjoy it. There have been lots of events that I wanted to enjoy as a relaxed audience member, but unfortunately I have been running around all through the festival and haven’t had chance to appreciate all of the different aspects of it. Q. What has been your personal highlight in the Fierce Festival 2012? Megan: Track by Graeme Miller. It was outstanding, one of the few events I was able to go to as a simple audience member with no responsibilities! I managed to go on Sunday morning which was a beautiful blue sunny day. Words can’t really describe it; I think it was just a fantastic experience – otherworldly! I am also going to Cupid tonight by Subject to Change, which I am very excited about. I managed to get a sneak preview of the set last week at the Midlands Arts Centre, which has made me anticipate tonight even more! Q. How did you get involved with Fierce Festival 2012? Megan: I sent an email to Laura McDermott and Harun Morrision, who are the joint artistic directors of Fierce Festival, asking them if I could get a placement and gain some experience at this wonderful festival. Thankfully they said yes! Q. So what are your plans for after Fierce Festival 2012? Megan: I want to carry on studying and get a PhD in Aesthetic Theory. Boring, I know, but it really interests me! Personally I would love to do creative producing in a festival like Fierce Festival, but who knows? Hopefully one day! Q. Finally, Will we be seeing you next year at Fierce Festival 2013? Megan: Absolutely, I am now converted for life!